NINETY-EIGHT DAYS OUT from the strait that was subsequently named after him, Ferdinand Magellan reached Guam, largest of the Ladrone Islands. Here, as in many other places, the pioneer navigator had a hostile reception from the natives, and here died Master Andrew of Bristol, the chief gunner and the one Englishman on the voyage. 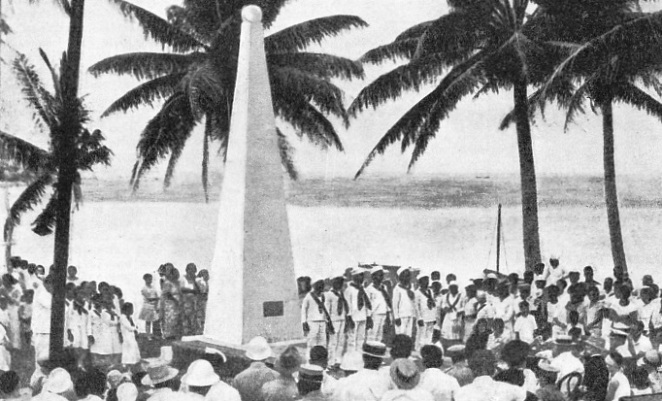 This photograph shows a monument being unveiled in memory of Magellan, who discovered Guam in 1521. The island, which has an area of about 210 square miles, now belongs to the U.S.A.
A KING’S meanness in refusing an increase in salary of a shilling a month to a man who had served him for some twenty years was one of the causes that led to the first voyage round the world. The monarch was King Manoel of Portugal, and the man Ferdinand Magellan. Magellan went in disgust to Spain, where he secured the backing and the ships that enabled him to discover the strait that bears his name. He was killed in the Philippines in an affray with the natives. Only a single vessel of his squadron completed the voyage of circumnavigation. Born a Portuguese about 1480 and named Fernao de Magalhaes, Magellan changed his nationality and his name to the Spanish version, Hernando de Magallanes; in English, Ferdinand Magellan. Of noble birth, he became a royal page and received a court appointment, later obtaining leave to enlist as a seaman in the fleet that sailed from the Tagus for India under Francisco d’Almeida in 1505. During his service in the East, Magellan showed qualities that gained him promotion to the rank of captain. Throughout his life he made only one friend, Francisco Serrano. Both were in a squadron which the Portuguese sent to Malacca, where they distinguished themselves during an attack by the Malays. When Magellan returned to court his rank and his salary were raised, his emoluments being increased from 1,000 reis (then the equivalent of five shillings) a month to 1,850 reis (about 9s. 3d.). The appointment held certain perquisites, and the salary was in the nature of a token. Reserved and a “bad mixer”, he soon had enemies. His heart was in the sea, and during his stay at court he studied navigation and talked with the captains of ships who had made long voyages. Magellan served against the Moors in Morocco, where he was wounded in the knee and permanently lamed. Unfit for active service, he was given the charge of cattle and horses taken from the Moors. He was accused of selling cattle to the Moors, and embarked for Lisbon without leave and sought an audience of the king, but was ordered back to Morocco. Later, armed with papers proving his innocence of the charges, he sought another audience, to ask for a salary increase of a shilling a month. On the king refusing, he asked permission to leave the court and be given employment in the navy. His request again refused, he asked permission to find employment elsewhere. The king contemptuously agreed, and when Magellan, whom the king had always disliked, bent to kiss his hand, he withdrew it, as an added mark of disfavour. Magellan limped out of the royal presence for the last time. existed, and so get across the barrier of South America. Then continuing west until he came to the Spice Islands, he proposed to take accurate observations to establish the longitude, and keep on sailing west to Spain. Magellan set out for the Spanish court at Seville, and after initial difficulties secured the support of the king. He married the daughter of a Portuguese who had become a Spaniard and was of great assistance to him. The five ships selected for the voyage were the Santo Antonio (120 tons), Trinidad (110 tons), Concepcion (90 tons), Victoria (85 tons) and Santiago (75 tons). They were old vessels, and authentic details of them are not available. Magellan chose the Trinidad as flagship, and she was probably about 75 feet long, and 21 feet beam, with 10 feet depth of hold. There were about 275 souls in the five vessels at the outset; only eighteen came back in the Victoria, excluding four natives who had been impressed. The Victoria alone made the round trip. The crews were cosmopolitan and included one Englishman, Master Andrew of Bristol, chief gunner of the Trinidad. Faleiro, Magellan’s partner, did not sail, having been superseded. The fitting out of the ships was hampered by intrigues, some of which were engineered by agents of the king of Portugal, whose hostility to Magellan continued. At last the five ships left Seville, sailed down the Guadalquivir to San Lucar, the port at the river mouth, and put to sea on September 20, 1519. At Tenerife, in the Canary Islands, stores, which had been sent out earlier, were taken aboard. While at the island Magellan received a letter from his father-in-law warning him of a rumour current in Seville. The Spanish captains were said to be in a conspiracy to mutiny when the time was ripe, and the ringleader was Cartagena, captain of the Santo Antonio. Thus warned, Magellan put to sea for the Atlantic crossing. the Santo Antonio (120 tons), Trinidad (110 tons), Concepcion (90 tons) Victoria (85 tons), and Santiago (75 tons). The Trinidad was Ferdinand Magellan’s flagship and was probably about 75 feet long by 21 feet beam, with 10 feet depth of hold. Out of the 275 men who had set out in the five ships only eighteen returned to Seville three years later, in the one remaining ship, the Victoria. Magellan was killed in the Philippines in 1521, when, at the head of forty-nine men, he attacked some 1,500 natives, followers of a petty chieftain who had refused to acknowledge the overlordship of another chief favoured by the Spaniards. A young Italian, Francisco Antonio Pigafetta, was one of the few survivors of the expedition, and his is t he best available account. Unfortunately for the seeker after facts, Pigafetta accepted as truth many things he heard, so that his account is a mixture of fact and fiction. He describes the crossing of the Equator, and the storms, during which they were comforted by the appearance at the masthead of the holy fire of St. Anselm. There was trouble before the squadron reached the coast of Brazil. Magellan kept south of the usual course and, when the captains of the other vessels asked him why the course was not more westerly, he told them to follow the flagship and ask no questions. Captain Cartagena, at a meeting of the five captains, was insubordinate about the change of course and was promptly put in irons by Magellan; he was later reduced to seaman. The squadron anchored in the Bay of Rio on December 13, and had the luck to arrive with the rain, which the well-disposed natives thought they had brought with them. Pigafetta did some good trading: for a playing card he received five fowls, for a comb two geese, and for a small mirror, or a pair of scissors, enough fish to feed ten men. Leaving Rio, the squadron encountered bad weather and ran into the River Plate for shelter. Magellan was not sure whether this might not be the strait leading to the South Sea and sent one vessel to explore. The captain, finding as he went on that the water became fresh and thus knowing he was in a river, turned back with the news. On went the squadron, hugging the coast and looking for the strait. Progress was slow; the coast was unknown and every bay had to be explored in search of an opening likely to be the strait. At the end of March, 1520, Magellan anchored in St. Julian Bay, in about latitude 49½ degrees South, to await fine weather. The men were weary of the search and they were dismayed when put on short rations. The squadron was supposed to have been provisioned for two years, but, by mistake or fraud on the part of the contractors, only about half the stores had been supplied. The order curtailing the rations aroused a spirit of mutiny in three of the five ships. The smallest vessel, the Santiago, was not involved. Captain Quesada of the Concepcion was the ringleader and was supported by Captain Mendoza of the Victoria; the disrated Cartagena also was active. Captain Mesquita, of the Santo Antonio, who was Magellan’s cousin, was loyal, and when Magellan had invited his captains to dine with him aboard the Trinidad, Mesquita alone appeared. There was clearly something brewing, and Magellan prepared to deal with it. In the night the mutineers rowed to the Santo A ntonio and captured the vessel and Mesquita, killing the mate. Quesada sent a boat to Magellan asking him to come aboard his vessel to discuss terms, which were that rations be restored to full allowance and that the ships should sail to Portugal. This second condition indicated that it was intended to deliver Magellan to the King of Portugal and to claim a reward for wrecking his voyage. Magellan acted promptly. Having seized the boat and her crew, he sent a boat to the Victoria ordering Captain Mendoza to come aboard the Trinidad. Mendoza refused and was killed by Magellan’s messenger. A second boat sent under cover of the first attacked the mutineers in the Victoria and captured the ship. The Santiago, the Trinidad and the recaptured Victoria shifted to the mouth of the harbour, imprisoning the Santo Antonio and the Concepcion. Daring the night the Santo Antonio, having dragged her anchors and fouled the Trinidad, was boarded and captured. The following day saw the surrender of the Concepcion, the only vessel remaining in the hands of the mutineers. AT THE END OF THE VOYAGE. On September 6, 1522, the Victoria arrived at San Lucar with eighteen Europeans and four natives on board her, and on September 8 she anchored at Seville. Magellan was dead, but his object had been achieved. 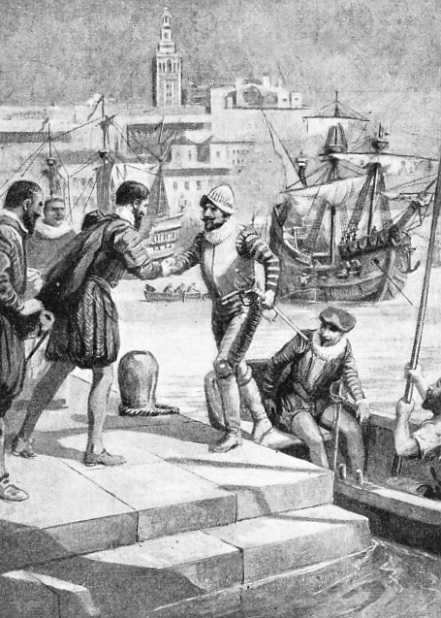 This illustration shows the survivors of the expedition being officially welcomed at Seville. sentence was remitted, and when the voyage was resumed they were released and returned to their duties. A curious point about the mutiny is that at the same place, Port St. Julian, the second circumnavigator, Francis Drake, sentenced Doughty to be beheaded for mutiny. Although Quesada had been executed a week after the squadron had reached the harbour, and the prompt action by Magellan had quelled the spirit of active revolt, hunger and cold weakened the spirit of his men and they petitioned him to return to Spain. Magellan said that only death would stop him and that rations could be augmented by catching fish and snaring birds. Still the men murmured, and a priest, Pero Sanchez de Reina, was arrested and sentenced to be marooned with Cartagena for inciting to mutiny. The next event was the loss of the smallest vessel, the Santiago. Magellan had sent her out to explore the coast to the south, and she was blown ashore and wrecked. The crew were in a sorry plight on that desolate shore. They were saved by the courage of two men who reached Port St. Julian with the news of the accident, so that aid was sent to their shipmates. Late in August the four remaining vessels left harbour, Cartagena and the priest having been put ashore with some bread and wine and left to their fate. Sailing south, Magellan intended to put in at the harbour of Santa Cruz, which had been found by the men of the Santiago. He was glad to reach the harbour, as the weather was bad He was about a degree farther south, however, and the days were lengthening. During the stay of six or seven weeks at Santa Cruz, the wreck of the Santiago was examined and all gear was recovered. Towards the middle of October the real start was made, and the third day out they sighted a large cape and an inlet that might be the expected strait. Two ships sailed in to find out if it were a strait or a river, and Magellan waited for five days until the two vessels returned with the news that the water was salt. Then the passage began. The two exploring vessels were commanded by Mesquita and by Juan Serrano, with whom Magellan had served in India. Juan is believed to have been the brother of Francisco Serrano, Magellan’s great friend. These two captains and the other officers of the squadron attended a meeting in the flagship some days after the squadron had entered the strait. Magellan said that they had undoubtedly found the strait, but because of the shortness of food, they could vote whether they should go on or return to Spain with the news. Every officer except Gomez, pilot of the Santo Antonio, voted for continuing, and Magellan turned to Gomez and said they would go on even if it came to eating the leather of the yards. The search for the right passage through the strait was then resumed, and it was a wearisome search in that desolate maze. Two ships were sent to search the channels leading south, and Magellan’s ship and the Victoria reached a river which they called the Sardine River. Here they anchored while boats went on ahead. The boats returned with the news that they had reached the sea, but that, of the two ships sent south, the Santo Antonio, commanded by Mesquita, was missing. It was discovered that Gomez, the pilot who had voted for turning back, had overpowered Mesquita, that a new captain had been chosen, and that the ship, piloted by Gomez, had reached the Atlantic and sailed for Spain. The whole crew told the story that they had sailed to the rendezvous, failed to find the flagship, and returned home, having deposed Captain Mesquita and put him in irons because he had tried to stab the pilot Gomez. The Spanish authorities were not satisfied, and put the principals, including the unfortunate Mesquita, into prison. When the little Victoria returned from her voyage Mesquita was released and honoured. Thus the squadron of four ships which had entered the strait on the Atlantic side passed into the South Sea on November 28 only three ships strong, after a passage that had taken thirty-eight days. After he had passed the Cape of Desire, now called Cape Pillar, and having the ocean before him, Magellan faced more than he knew. When he had realized the defection of the Santo Antonio he asked his officers to speak frankly. He believed that the land on the south of the strait was a group of islands and that there was a way round them, but the stock of food remaining was so meagre that there was no time to be lost in exploration. Relying on his maps and globes, Magellan thought that he had about thirty or forty degrees of longitude to traverse to the Spice Islands, but he had 150 degrees in front of him. Had he known this it is doubtful if he would have sailed out of the strait. He had one stroke of luck, fair weather, and he therefore named the ocean the Pacific. Magellan’s statement that he would carry on even if they had to eat the leather of the yards came true, for Pigafetta says: “We also ate the oxhides which were nailed under the mainyard so that the yard should not scrape the rigging; they were very hard on account of the sun, rain and wind, and we left them for four or five days in the sea, and then we put them a little on the embers, and so ate them.” They also ate sawdust and rats. The drinking water was yellow. This passage across the mightiest of the oceans was so terrible that Pigafetta said with justice: “I think that never man will undertake to perform such a voyage.” Those who at last followed in the wake of Magellan took care to be better provided. When Magellan’s vessels emerged from the strait they encountered a westerly wind which kept them close to the shore on the port tack for some days. Magellan must have been relieved when the wind became free, enabling them to set a course north-west. Luckily he crossed the Pacific at a time when the south-east trade wind extends for nearly thirty degrees south of the Equator. For two months the ships went on, the first vessels in that great sea. nothing here, too, they called the islands the Unfortunate Islands. At Guam, largest of the Ladrone Islands,which Magellan reached ninety-eight days out from the strait, the natives stole everything they could from the ships; even before the anchor was let go they had cut the painter of the skiff towed behind the Trinidad and had gone off with her. The angry Magellan landed armed men, who burnt the houses of the islanders, killed seven men and recovered the stolen boat. It was at this island that Master Andrew, of Bristol, the chief gunner, died, having succumbed to the privations of the long voyage. These islanders were so ignorant that they could not understand bows and arrows. Food having been secured, the ships sailed to the Philippines. Efforts were made to persuade the people to become Christians. The chief of Cebu was baptized and had an opportunity of becoming paramount with the aid of the white men, but a smaller chief refused to pay tribute to him. Magellan, determined to punish the recalcitrant chief, set out in personal command, despite the entreaties of his subordinates, and refused the aid of thirty war canoes manned by 1,000 natives. With only three boats and forty-nine men he landed to attack about 1,500 natives, believing that his soldiers’ armour made them invincible. The men, against the orders of Magellan, opened fire at long range, and their muskets were ineffective. Magellan, already lame in his left leg, was now wounded in the right by an arrow, and gave the order to retreat. He was overwhelmed and killed. The chief of Cebu now plotted to murder the Spaniards, Magellan’s slave Enrique, who was to be freed under his master’s will, joining in the conspiracy. Serrano and other officers were killed, but the three vessels escaped with Captain Carvalho as captain-general. The Concepcion was now abandoned after her cargo and crew had been transferred to the Trinidad and the Victoria. In November, 1521, the two vessels reached Tidore, in the Moluccas, but before this Espinosa had replaced Carvalho as captain-general. Tidore was the place for which Magellan had been bound, and here an alliance between the Spaniards and the king was made. The Trinidad’s condition was now so poor that it was decided that Captain Sebastian del Cano should sail the Victoria for Spain and that the Trinidad should remain for repairs and then sail across the Pacific to Panama. The Trinidad attempted but did not achieve this voyage. The little Victoria sailed with forty-seven Europeans and thirteen natives of Tidore. Even this small complement was sadly depleted by scurvy and starvation on the homeward voyage, as the vessel was now in the Portuguese hemisphere and dared not touch at any port where Portuguese were likely to be found. The Victoria passed the north coast of Timor, and began what the Spaniards hoped to be a non-stop passage to Spain. The meat soon became rotten and they were reduced to rice and water long before they had gained the coast of East Africa. Their longitude was miscalculated, and they turned north, thinking they were west of the Cape of Good Hope, only to find when they saw land that they were on the east side. They anchored and made another attempt, this time successful. Calling at one of the Cape Verde islands for provisions, they narrowly escaped capture at the hands of the Portuguese. On September 6, 1522, the Victoria limped into San Lucar, and on September 8 she was anchored at Seville. Aboard her were eighteen Europeans and four natives of Tidore. The white men were the first to sail round the world. CAPE PILLAR, at the western entrance to the Strait of Magellan. When the intrepid seaman had passed this point, originally called the Cape of Desire, he faced an ocean that he named Pacific, because, beyond the strait, fair weather set in. The crossing of the Pacific to the Ladrone Islands entailed great suffering because of lack of supplies. You can read more on “Instruments of Navigation”, “Supreme Feats of Navigation” and “The Voyages of Captain Cook” on this website.